Head for Merzouga, the desert with beautiful dunes. Camel riding and camping is the highlights in the desert. Driver over Hight Atlas Mountains. 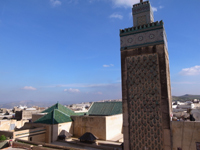 In Marrakech, visit exciting Medina and find a beauty of Islamic architectures. Drive over the High Atlas Mountains.